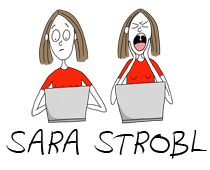 My name is Sara Strobl. I studied literature and scriptwriting in Valencia (Spain). Later I started writing and shooting my own shortfilms and I realized that the part I enjoyed most was the drawing of the storyboard. After I moved to Berlin in 2007, I concentrated more in the drawings and finished my first graphic novel “Oh, my guts!” in 2011.